I hope I made it clear that I consider The Stalin Cult an excellent work of political and institutional history, from which I learned a great deal about a subject I care about. But my objections to its treatment of the visual culture so central to Stalin’s personality cult do not end with circles. And I do like a good argument. (Can I blame my parents? I grew up in household where arguing about ideas was a sign of love and respect.) Plamper’s discussion of individual works of art may, as he put it, “borrow tools from contemporary visual studies,” but it does so rather unevenly. The result is a book that deserves all the praise it has received from the other bloggers, who largely ignored the visual, but it doesn’t give us a proper sense of the visual culture that made up the cult or the visual experience of living in it. About Socialist Realism: the point I wanted to make is that, while Plamper gives an abundance of evidence showing the dynamic processes involved in producing Socialist Realist paintings, he vacillates when it comes to characterizing those processes. At times he acknowledges the roles of uncertainty and interpretation but at times he represents Socialist Realism as a coherent doctrine imposed from above. At least, that’s the way I read it. I wanted to better understand how painting compared with the other arts that have been studied more thoroughly. 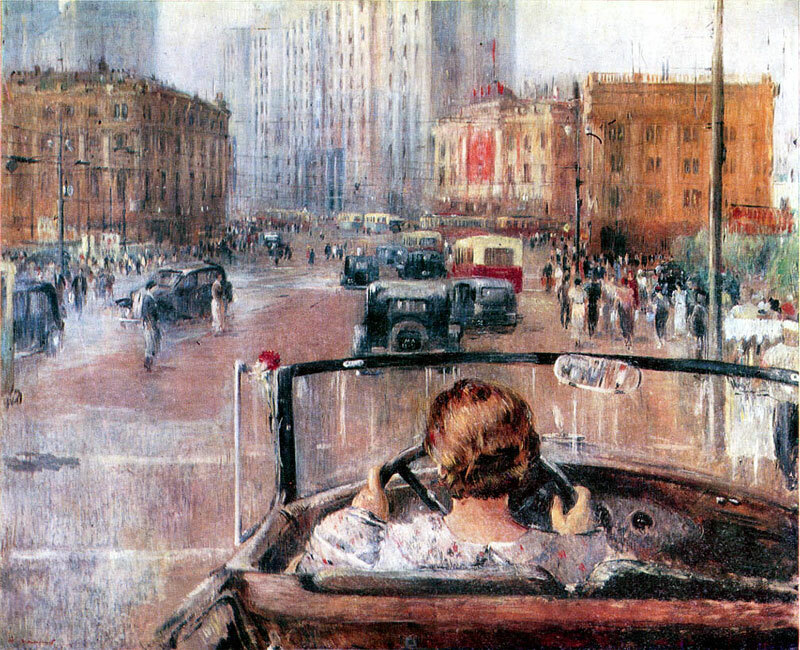 About the paintings: first, whatever Plamper thinks of Matthew Cullerne Bown’s works (Socialist Realist Painting  and his much shorter survey, Art Under Stalin ), they include analysis of portraits of Stalin that not only use the “tools” of art history analysis, but make many of the same points Plamper makes about the portraits. And in Russia, examinations of these paintings also began among art historians in the 1990s- albeit sparingly. Or facetiously, if one includes Komar and Melamid. Second, I focused on the problems with Plamper’s argument about geometric compositional elements because I thought they were typical of the ways he tries to link the concepts he discovers underlying the Stalin cult and the visual images that were supposed to represent and convey those concepts. I didn’t so much take Plamper’s circles too literally, as I apparently took him too seriously. “The circle was the seminal Stalinist shape used to structure space” (98); it “serves as an organizing theme in many other paintings” (105) And (speaking specifically of visual strategies), “concentric circles became the dominating pattern of spatial arrangement” (97). It seems to me, that if we are using the tools of visual studies, we need to see the center of a circle and the center of a triangle and a various groupings of figures on a flat plane as different things. If circular ideas (rather than structures) were so important, why do they not show up in composition? What are we missing by imposing a reading that doesn’t hold up—what else is going on in these pictures? It’s no surprise that Stalin is at the center, so let’s be precise about what is going on around him. But ok, let’s talk about a different element in these portraits of Stalin: Plamper compares sightlines and the gaze in Morning of the Motherland with that of nineteenth-century, Romantic, landscape painting in the US, pointing out differences in composition and placement of the figure in a Thomas Cole painting. In the Cole, he argues, the landscape embodies the utopian future, whereas in Morning of the Motherland, Stalin alone “embodies the bright future” (110). We see Stalin from the front, gazing off toward a future only he can see, unlike in the American painting where we adopt the viewing position of the figure and look along with him at the fecund fields and inspiring mountains. 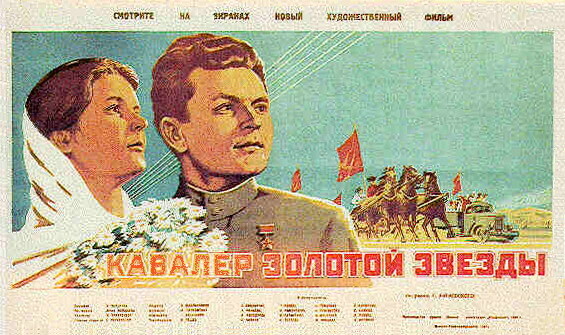 Plamper dismisses the interpretation that the Soviet post-war landscape, with its vibrant, young trees, its freshly plowed fields, and its rolling tractors represents future progress, claiming instead that all that fertility is historically behind Stalin, who “has consummated a monopolization of progress” with his gaze (111). Stalin excludes us in his vision as decisively as the tiny figure in the painting from a “liberal-democratic” culture invites us to gaze with him, –a democratic gesture. Here I think Plamper’s concentration on the portraiture of the Stalin cult skews his reading. He argues that portraits came to dominate painting and “all other genres (landscape, still life) were devalued” (91). Whether or not this is true, the absence in this statement and the book as a whole of what Soviets called “thematic” painting (and elsewhere, “genre painting”) is striking. “Thematic” paintings –- that is group scenes from everyday life or extraordinary heroic exploits, — were certainly plentiful during this period, and they figure in the Stalin cult, even if Stalin is absent (as Plamper does acknowledge). In some of these scenes, as well as in some portraits of ordinary people, figures are shown performing the utopian gaze. We even have some Socialist Realist “thematic” paintings that invite the viewer’s gaze into the picture frame by depicting figures from the back. Stalin’s gaze is certainly impressive in Morning, as is his domineering bulk set against the distant, wide land, but it’s only a monopoly inside this picture and it doesn’t exist independently of other, similar representations. All these images functioned intertextually and that challenges Plamper’s reading. 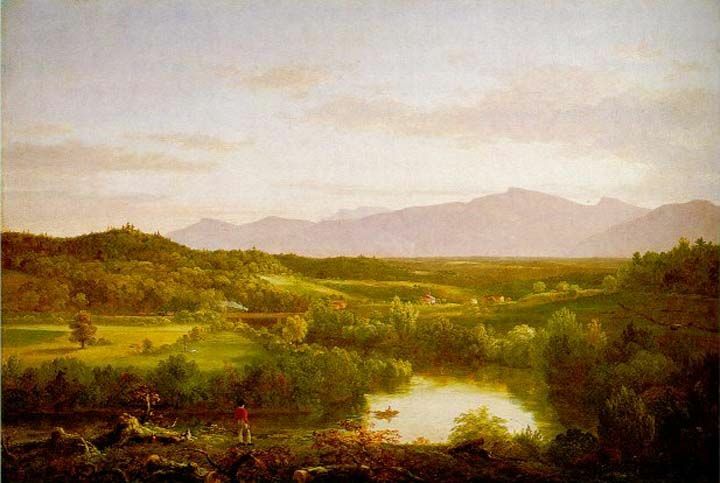 It makes the comparison with Romantic landscapes seem arbitrary and leaves us without a visual context for reading this painting. 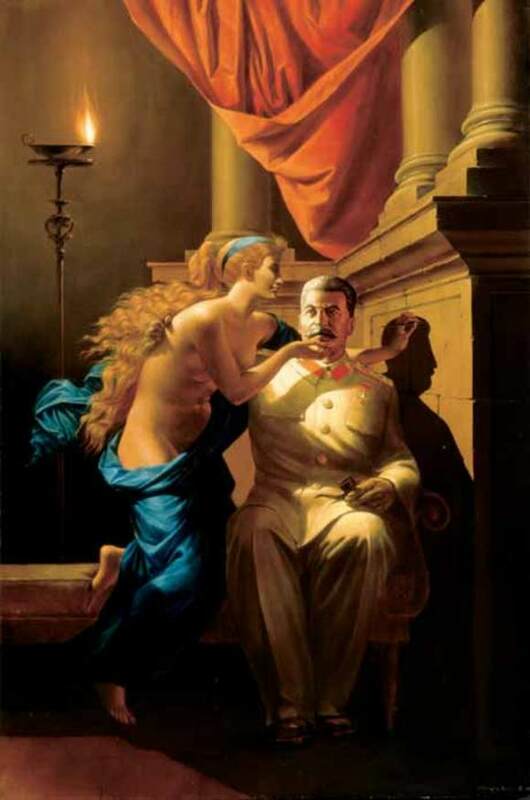 So far I’ve been talking about interpretations of individual paintings, but we don’t get much sense of how all these images functioned together to create an environment in which images of Stalin took a variety of forms and were accompanied by images (and texts) presenting Stalinist cult ideology. To take just one other example, it’s impressive that Plamper looked at every page of Pravda from 1929 to 1953, but I was disappointed that, while he makes a gesture towards the “transmediality” of Socialist Realism (256), he discusses the Pravda photographs without mentioning the texts in which they were embedded. Who looks at a newspaper without reading a word? It was strange to read about the pictures of Stalin with no discussion of the ways the texts and images commented on one another. So I was left feeling that I hadn’t learned enough about Pravda’s contribution to the cult. Here I think the problem with this approach to Pravda is related to an assumption stated in the introduction, namely that the Stalin cult was produced for and consumed by a population that was illiterate: “whose mental universe was shaped primarily by images as opposed to words” (xv). Now I find this odd: why are visual images the main alternative to reading? There are other senses and feelings, not to mention speaking, there is experience and memory, and oral upbringing and tradition, and so on, all of which shaped the lives of people who couldn’t read. Besides, in 1937, 75% of the population was literate (up from 56.6% in 1926). Were these photographs (and paintings) really designed with illiteracy in mind? Can we understand them without reading the texts that surrounded them? I realize that it is a convention of visual analysis to contrast pictures and words as Plamper does in the introduction, but it is too narrow a frame. As he ultimately shows, even those who were organizing the production of the visual cult weren’t assuming that the visual had unique power over the other senses and experiences, but rather inserted itself into those experiences. If Plamper had skipped a few months of Pravda each year and devoted more attention to the ways images of Stalin were deployed intertextually in the newspaper, we’d have a much better understanding of the function newspaper photos performed in the evolution of the cult. It’s important to know that Stalin’s photo didn’t appear in Pravda every day, especially during times of crisis, but it did appear in offices, on streets, in newsreels, in other newspapers and magazines, as well as at art exhibitions. In addition to more accurate readings of the paintings themselves, Plamper could have provided a better sense of the role these paintings and photographs played in creating the Stalin cult as an everyday experience. I believe he could have even mined more from the comments books that he reads so well but so tentatively if he had been thinking about the connections among paintings, and between journalistic photographs and text all along. This entry was posted in Blog Conversations, Russian and Soviet Art, Soviet Era 1917-1991, Soviet Intelligentsia, Stalinism, The Stalin Cult and tagged "Socialist Realism", painting. Bookmark the permalink. thank you very much for elaborating. I like your point about looking for the utopian gaze not just in Stalin *portraits* and agree that I didn’t take genre paintings seriously enough. In your examples, the film poster of _Kavaler zolotoi zvezdy_ illustrates how this gaze traveled even outside the confines of Stalin paintings. I’m less sure about about Laktionov’s _Moving to the New Apartment_; are you saying the mother with the headscarf gazes into utopia? The smile is incongruous and her gaze seems to be directed more upward. 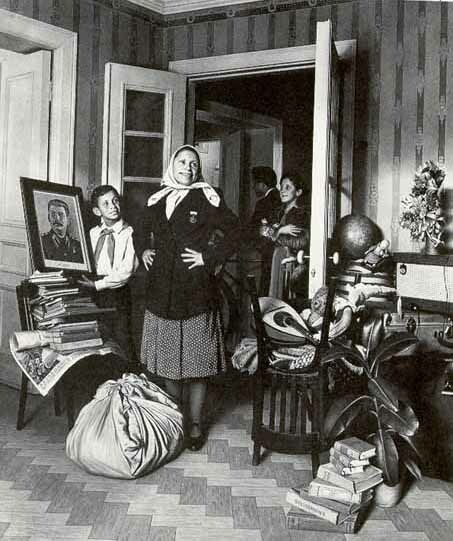 One could actually read the son’s holding of the Stalin portrait as an attempt to redirect her gaze to the true source of her bliss and the person ultimately responsible for giving her an apartment: Stalin. I wonder how Oliver Johnson, who wrote a dissertation on Laktionov under Susan Reid’s direction at Sheffield, interprets her gaze. Oli, do you want to chime in? At any rate, I’m glad we’re now having a discussion about concrete readings of pictures. We’re not going to achieve consensus, but that’s fine. I’d still be interested in your own thoughts about why the fence is broken in Gerasimov’s _Stalin and Voroshilov in the Kremlin_. My own take on it is that the gaze is an artistic strategy to create a three-dimensional sense of space within the canvas, perhaps in order to offset the potentially claustrophobic effect of the jumble of everyday possessions, which viewers complained about also. As a compositional strategy it is an effective one that is complemented and balanced by Stalin’s divergent gaze and the diagonal perspective of the room itself. Perhaps utopian then in the sense that space was a particularly valuable commodity of the time, but not, I think, in the same sense as Stalin’s future-gaze in ‘Morning’. More striking to me is the fact that Stalin’s portrait is not the compositional centre or high point within the image, although of course it is the narrative perogative within the painting. On the subject of ‘Stalin and Voroshilov’, I am not inclined to agree with the argument that the absence of the fence implies boldness in the face of peril (see Dragan Kujundžić in ‘The Ghost of Representation, or the Masque of the Red Death’, Art Journal, vol. 49 (no. 1, 1990) – such an acknowledgement of the possibility of peril seems to me to go against the trend in Socialist Realist painting from the period. I suspect that Gerasimov simply did not want to place a solid barrier between the two leaders and the vista of ‘work-in-progress’ Moscow behind them. It would render the river and embankment almost invisible and would create an unbroken divide through the middle of the canvas, when he was trying instead to emphasise the connection between the figures and the city beyond. I would be most interested to read any alternative readings.